Last 1 boy and 2 female left. 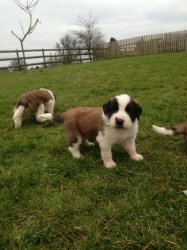 Our beautiful St Bernard has given us the most amazing litter of healthy rough coated St Bernard puppies. Puppies have been brought up in a loving family environment, extremely well socialized with children. registered, wormed to date, micro-chipped. We have 3 girls and 6 boys they can be sold to pet homes. If you can offer these puppys 5* home please get in touch. R1000 non refundable deposit will secure your puppy. No time wasters!! Thank you. Puppys can leave on the 25/4/16.